Yesterday broke all records for single-day rainfall. It was WET! c) the water is not fast moving or rising rapidly. Most drownings happen when things get out of control – really fast. d) unclasp seatbelts (easy escape). e) Take off any backpacks or bags, and move them out of the way (back seat or boot). Especially ensure that there are no bag straps or items that may trip or impede your movement within in the car. Car lights surprisingly often stay on even when cars are very submerged, and have saved countless lives by enabling rescue teams to find cars in bad conditions and orient themselves. Open windows have also enabled many quick escapes (ignore the rain! It WON’T kill you! ), and unlocked doors can save precious seconds, while automatic locking doors and seatbelts may seize up in stress conditions and trap you. 3. Plan an escape route. Prior to crossing, driver organise WHICH direction the car members will move in, should they have to exit the car. Point this out to all car members, and ensure everyone knows and is in agreement about WHERE you will go in case you have to make a quick exit. 4. Explain the ROOF command. If no exit is possible, the car driver will shout “ROOF” and members will climb to the roof of the car, or hold on to the roof above the doors. With windows open, many cars have handles just inside the doors (above the windows) which make ideal handles to hold on to in this emergency situation. The sun visors in the front seats are also ideal for holding, and very strong. Cars have been known to float for several minutes in flood situations, and this may be your best option, rather than leaving the car. 5. Know your buddy. Explain the “hold hands and smallest member” safety. Members of the car will hold hands upon exiting. If there are three members, the smallest member in the middle. If four or more, adults allocated children, or stronger members allocated weaker / smaller. 6. Mobile phone emergency number on speed dial. You should already have this, right? Keep your mobile phone in your pocket or readily available, so you can dial for help if you run into problems. 7. Drive through at medium pace, to the conditions, in low gear. This is pretty straightforward. Our previous record for a single day was set in May 2010 with 83.4mm. Yesterday’s fall was 132mm by around 7pm, and I don’t know how much fell overnight, but it was still pouring by midnight, when I finally fell asleep. The carpark. 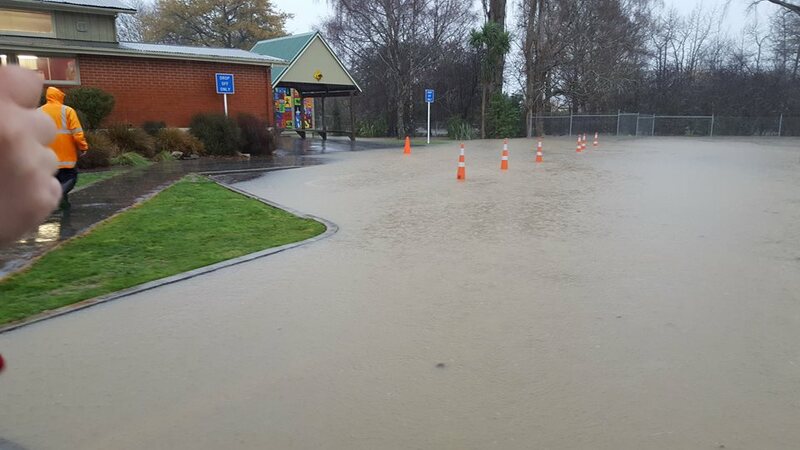 Photos from the East Taieri School Facebook page. When I picked the kids up in my little car, I got them in then, for the first time in my life and hopefully the last, went through a quick safety drill about What to do when crossing floodwaters in a car, and gave them the drill I listed above. All of it is pretty straightforward, common-sense stuff. My kids were excited about not wearing their seatbelt, and I was pretty apprehensive as the water came up almost over the bonnet of the car. 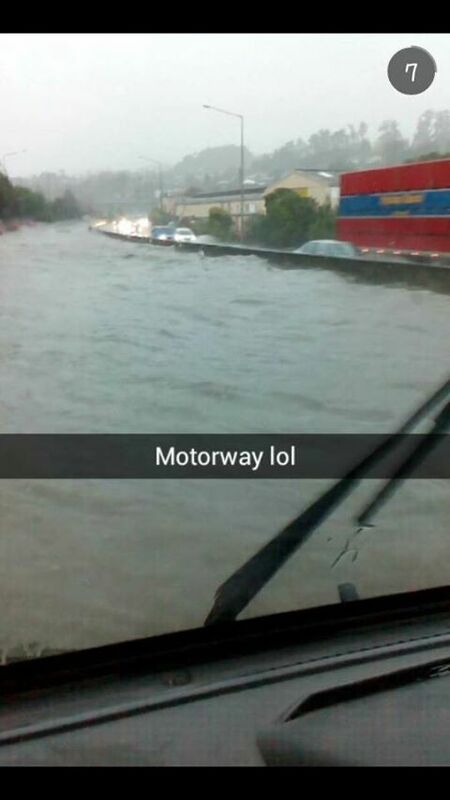 Luckily we were never in danger, and only had to drive through about 50 metres of water less than a metre deep. The motorway, near Green Island, just outside Dunedin, New Zealand. 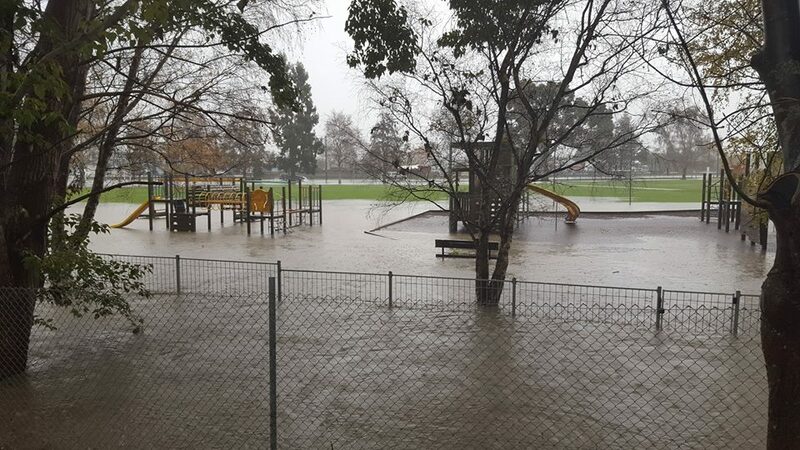 Not surprisingly, the school is closed today, as are most of the primary schools in Dunedin. Many houses in low lying areas are dealing with flood damage, and there is raw sewerage floating in some of the streets because sewers have burst. The Dunedin City Council is going to have hell to pay over this, as they’ve been busy wasting money on beautification projects, art galleries, chinese gardens and stadiums for the last few years instead of doing essential maintenance work, is how I see it. So today, the cleanup begins. People are not happy. But on the bright side, there have been no reports of deaths or injuries. So we should be thankful. But this is the third “1 in 150 year flood” we’ve had since 2006, at which point I really want to hit climate change skeptics over the head with something heavy. I mean, how much water do we need before they wake up?